27 DEC 2007 - BugFix: fixed a bug introduced with Bon Voyage, that broke the slices animations (on the last bite, the slice mesh reverted to its full shape). If you have Bon Voyage (or newer), please redownload. It's not Christmas in Italy, without a Pandoro or Panettone! The "Panettone" is a typical Italian Christmassy cake. The Classical Panettone, originally created in Milan in 1490 and then exported in the whole Italy, is a tall, sweet bread, stuffed with candied fruit (particularly citrus) and raisin. There are many legends about the origin of the "Panettone". The most popular concerns a young Milanese nobleman who fell in love with the daughter of a pastry chef named Toni, to impress the girl's father, the young man disguised himself as a baker's boy and invented a sweet, wonderful bread of rare delicacy and unusual size with a top shaped like a church dome. Hence the name "Pan de Toni" (Tony's Bread). The "Pandoro", on the other hand, was originally created in Verona in the 18th century (probably even earlier) and then exported in the whole Italy; it is second only to the Panettone in holiday popularity. The name "Pandoro" derives from "Pan de oro" (Golden Bread), because of its golden color due to the eggs. It's a tall leavened cake topped with powdered sugar; it's peculiar shape resembles a Christmas tree covered with snow, or a twinkling star (if you cut it horizontally, each slice is a star). Nowadays, Panettone and Pandoro are both well-known around the world and a wide range of varieties is available. Panettone - Classic: it's the most traditional Panettone, stuffed with candied fruits and raisin, and without any frosting or topping. Panettone - Almonds Frosting: this version of Panettone doesn't have candied fruits nor raisin, but it has a sugar frosting decorated with sliced almonds. Pandoro - Classic: the traditional Pandoro, with no filling nor frosting; only a lot of powdered sugar poured over it. Pandoro - Chocolate: this Pandoro is filled with chocolate cream and covered with a chocolate frosting. Pandoro - Cream: similar to the chocolate one, but with white cream. Pandoro - Layered: this is the most caloric one! It's filled with three different flavours of cream and covered with mascarpone decorated with sugar drops. 1) The Plate must be installed in any case! It's used by *all* the types of Panettone and Pandoro. 2) The Classic Panettone is the MASTER, needed for the Almond Panettone to work. 3) The Classic Pandoro is the MASTER, needed for the other flavours of Pandoro to work. 4) All the flavours different than the Classic ones are SLAVE of the corresponding Master. You can buy Panettone and Pandoro from the Buy mode catalog (section Misc/Party). 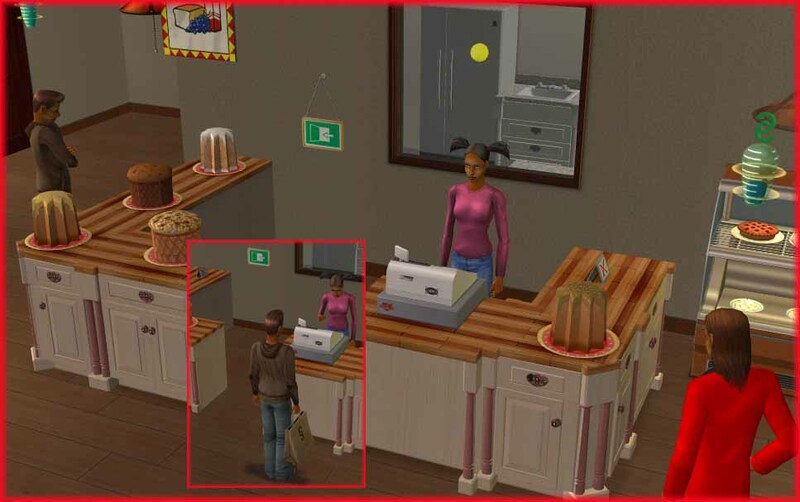 Put them on a surface and order a sim to "Cut" it: the sim will cut it with a knife and then all the other sims will automatically grab a slice. Up to 12 slices can be grabbed from each Panettone and Pandoro. Please notice that these are baked cakes, and therefor they get spoiled quite late, after 2 sim-days. OFB users can put them on sale in their shops, and they are correctly restocked; they can't be placed in refridgerators, but don't worry: customers love Panettone and Pandoro, and will buy them well before they get spoiled! 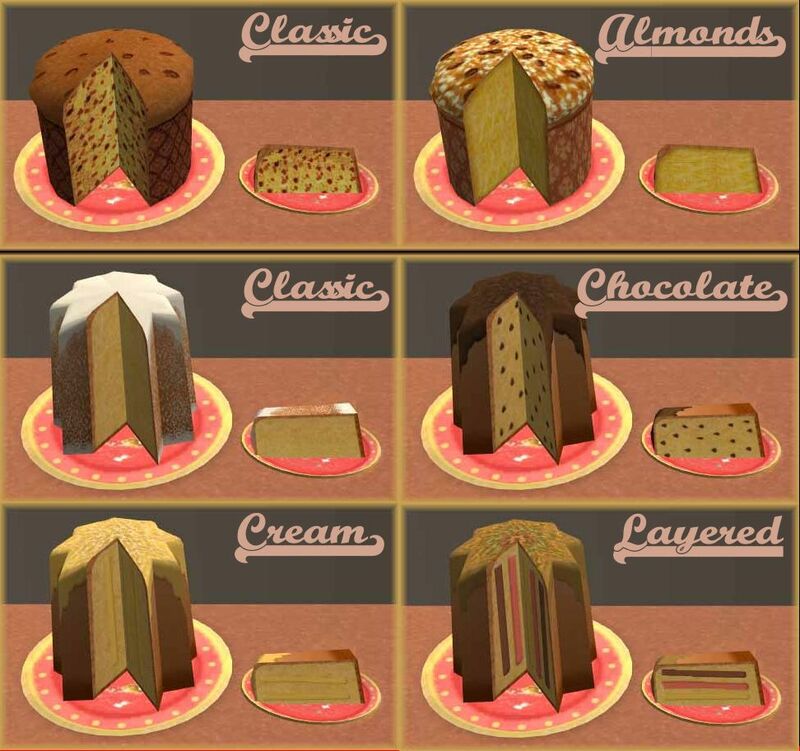 Both the Panettone and the Pandoro (in all the different flavours) are compatible with *any game*, including the base-game only. Just like any other food, neither the Panettone nor the Pandoro can be recoloured, due to their complex internal structure. Please DO NOT CLONE and DO NOT REPOST ANYWHERE. You can include these items in your lots and post the lots on free sites (NO EXCHANGE!!! ), but you must credit Marylou & Numenor and provide a link to this very thread (not just to MTS2). 4 news foods : french fine pastries - fully animated !